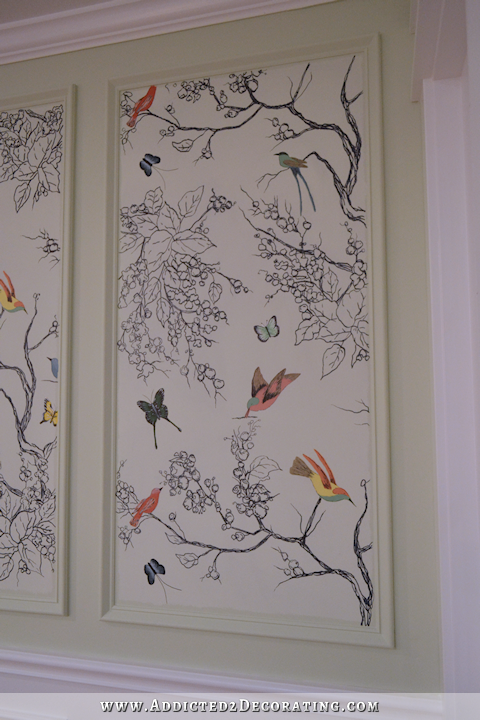 I’ve been wanting this somewhere in my house for a very long time now, and I finally have my Schumacher-inspired birds and butterflies “wallpaper”! I decided to put it in my entryway, and I’m so glad I did! It seriously brings a smile to my face every time I see it. That part actually went pretty quickly. The birds and butterflies, on the other hand, seemed to take forever. 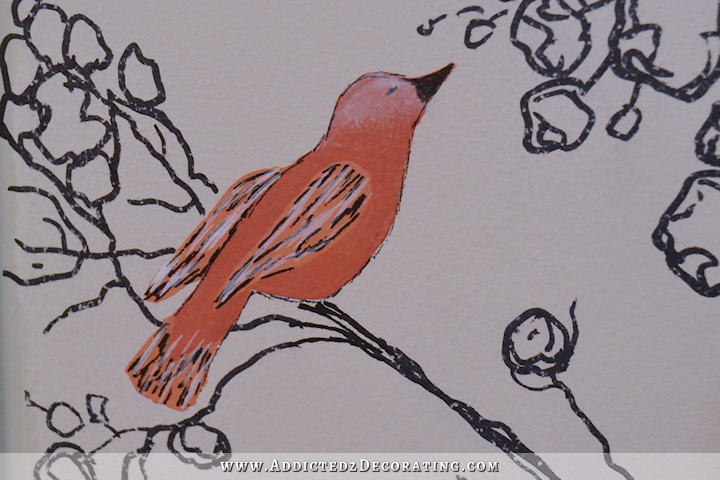 I painted each bird and butterfly a solid color, and the went back and painted the accent colors. Then I added some accents with permanent black markers, and then on some of them, I followed up with some white highlights here and there. I know I’ve said I’m not a butterfly kind of person, but I’m actually really glad I added them. With just the birds, the mural seemed to be missing something. 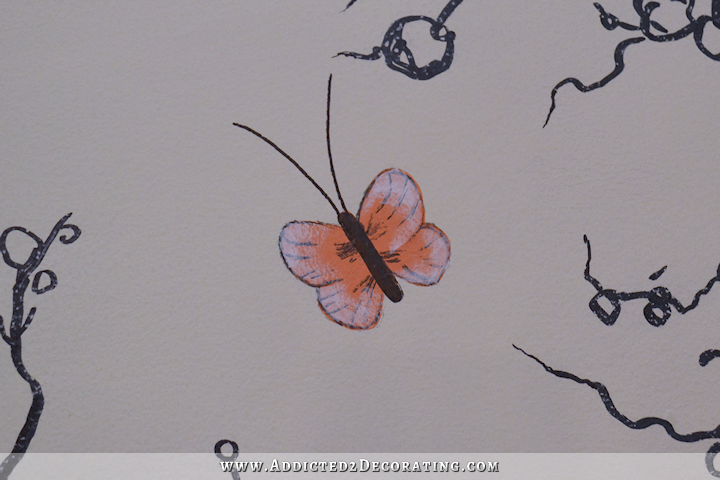 Those butterflies really added the finishing touch. You can click on this picture to see a bigger version with better detail. It’s not quite finished, and I actually created a real headache for myself. 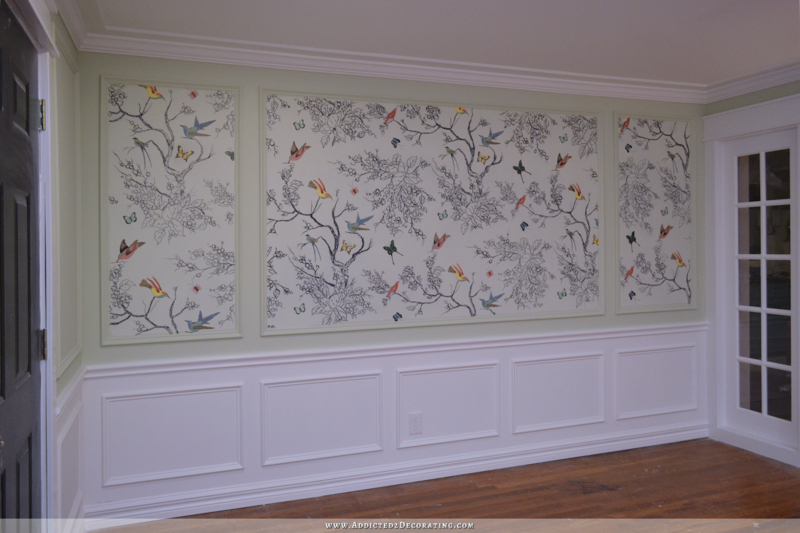 When I started this project, I had envisioned adding a border around each of the panels (either a painted border, or perhaps ribbon). And because I was expecting to cover the very edges, I didn’t paint the background color or draw the mural right up to the edges of the panels. But when I got it finished, my mom, brother, sister, and Matt all agreed that it looked better without any borders. So now I’ve got to go back and finish out the edges. Anyway, I’m so happy to finally have my birds and branches. 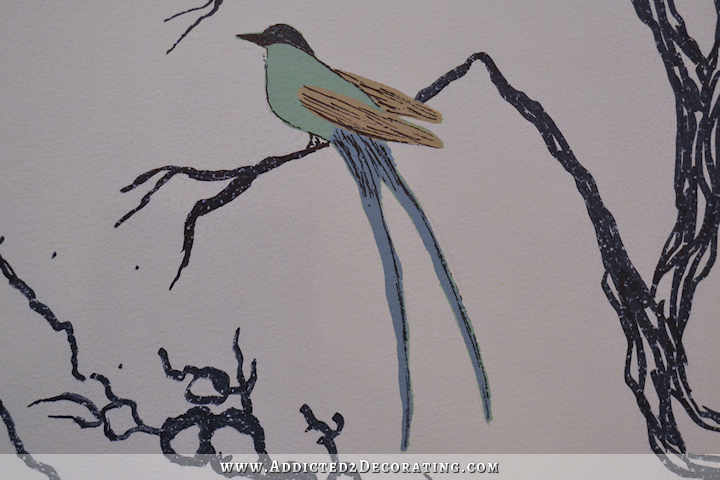 I love the color and whimsy that it adds to this room. 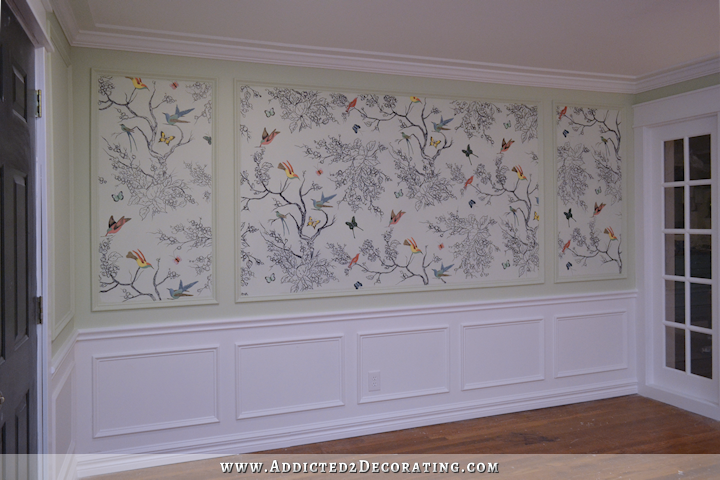 I really wrestled with how to finish out this mural around the edges of each panel. Going back and painting the background color around the design would have taken hours. I tried that on a small portion, and not only did it take a long time, but it didn’t look good at all. So I stuck with my original idea of adding a border, but instead of doing a black border as I had originally intended (which I think would have been way too much), I decided to do a thicker border in the wall/trim color, and then finish off with a very thin gold border. I first taped around the design and then painted the thick border the wall color. 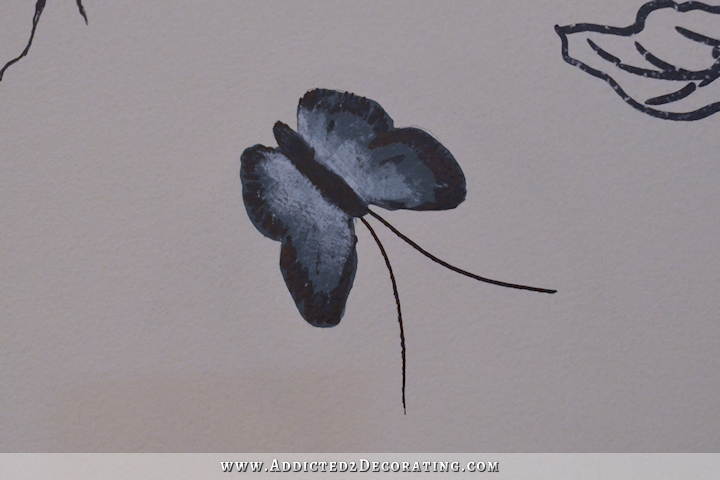 Since I had drawn the design with a permanent marker, I had to cover the border area with an oil-based primer first, and then used two coats of the wall color (Behr Feng Shui). Then I went back and taped off a very thin border around each panel, and used Martha Stewart Liquid Gilding in gold to create the thin gold border. I’m really glad I went this direction instead of doing the thicker black border around each panel like I had originally planned. The black would have been too much, and probably would have taken away from the design. I think the gold adds the border that was needed to finish off the design, but in a much more subtle way that doesn’t detract from the design. 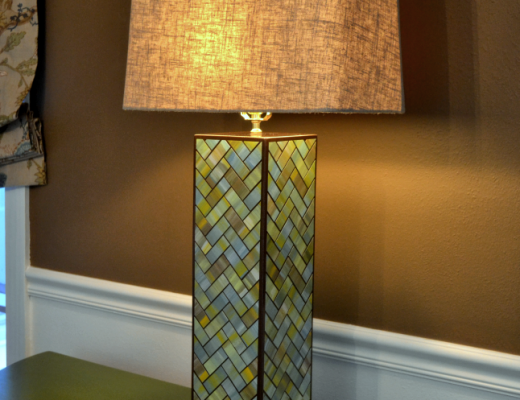 Watercolor Tile Herringbone Table Lamps – Finished! This is breathtaking. Absolutely gorgeous. Absolutely LOVE it! You have so much talent. That is just gorgeous! You are a very talented woman! You go! For some reason I thought that at some point you were thinking about painting/adding some color to some of the berries. No? And are you going to be able to get outside and paint before it gets too hot!?!? You’ve gotten me invested in all these projects and I’m dying to see how you complete them. You must be dying, too. Or you must just be way more patient than I am! 🙂 Keep posting! No, I won’t be adding color to the vines/berries/leaves. Just the birds and butterflies. 🙂 My drapery fabric is arriving today, so I might even have something made to show y’all by the end of next week! I’m still waiting for a stretch of good weather in order to do the exterior. We have a couple of days here and there, mixed with days with really high wind, or days that are too cool (for this Texas girl) to work outside, or rain, or drizzle. I’d like a good, solid week of beautiful sunshine and 70+ degree weather in order to start the exterior. I’m sure you were disappointed after last week…but what an opportunity it gave you to revisit your original plan. Soooooooo beautiful! And the perfect “thing” for that wall space. I love butterflies so I’m glad you included them. That really turned out well! But are you not concerned about the market fading or having aflat look to it? 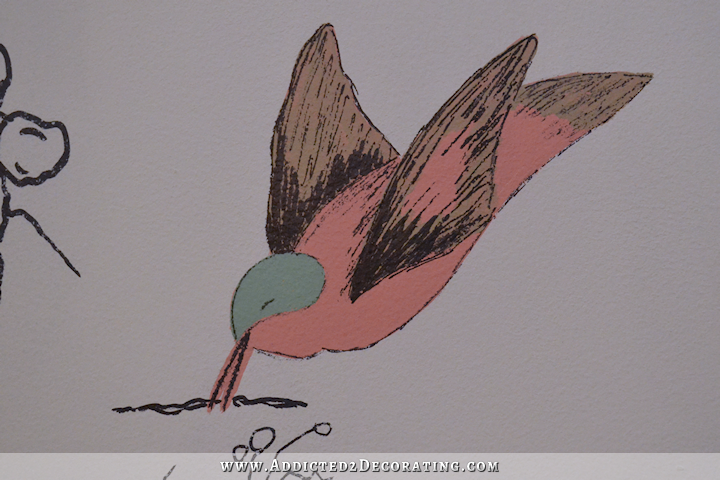 From the pictures, the marker looks as good as the paint but how does it look in real life? From the pictures, its really wonderful and unique. By the way you and your mom are terrific artists, I love your detail close ups. In person, the marker looks the same sheen as the paint. It doesn’t look like marker. I noticed it actually gave the bark a texture, which I found to be pretty cool looking! Great job Kristi!! This is simply stunning. I cannot WAIT to see it with the coral buffet (please tell me that’s a keeper!). I would think that putting anything over it to preserve it might create the potential for yellowing, but wonder about possible fading? If you do decide to seal, I’m guessing you will test the result on a piece of scrap drywall. I cannot wait to see the rest of the room. The green paint, which I loved without this design, REALLY shows this off. Way-to-go. Also happy that you got some true creative time in. ENERGIZING. You’re right about the drywall…definitely test first…I’ve tried to seal permanent marker and can bleed. 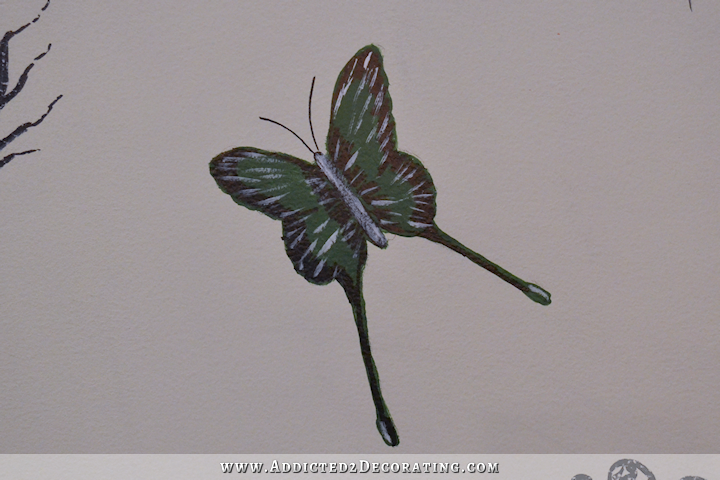 Yes I doubt anything is going to fade on that wall because there isn’t a lot of direct light on it but I have painted rocks and used sharpie and any of the spray sealers I used just smear the sharpie. Yay, you posted! I was worried that I would have to survive the weekend without an update …. and it is looking fab! It looks so blissfully happy … everyone will smile to see it. Wonderful! Just Wonderful! What else can be said? I adore it! Wow! I love, love, love it so much! That would make me smile every time I saw it too. That looks AMAZING! You’re very talented, for sure. I’ve so been enjoying watching how your home is coming together. Thanks for all the inspiration! Wow….all I can say is WOW! This pulls everything together and it looks amazing. You should feel really good about this. Absolutely stunning. You are so creative and able to follow through. Congratulations on another great project. Absolutely gorgeous!!! You are soooo inspiring!! Can’t wait to see the rest of the room!! This is so unbelievably awesome!!! That is absolutely beautiful !!! I am blown away. Simply beautiful. I love it! It just seems to me it was meant to go there all along. Me again. I just want to add I can’t wait to see the coral buffet in front of it. I bet it will look spectacular! Well, now we know why the dining room wasn’t working. You needed to do this first! Congratulations, it’s beautiful and very right for the space. I think you really found a good balance between “not enough” and “too much” by putting it inside the molding, rather than covering a whole wall. I also agree that adding the butterflies gives it a little more interest. Holy Moley, Kristi, that is absolutely amazing! The concept, the execution, the finished visual product, words fail me, lol. It IS fabulous, gorgeous, beautiful, all of the above. Now, it seems to me, that this is now a dominant feature in the space, so how will you integrate your dining room fabrics, the watercolor fabric, the striped fabric, etc., into the space without their competing with this wall??? You are so talented! This turned out perfect!!! Kristi it looks amazing. You are such an inspiration!!!! I have to admit that I have never been crazy about this wallpaper idea. It always felt too busy for me on a full wall or room. But when I opened this post I grinned from ear to ear and my first thought was ‘this is absolutely beautiful, she has done it again’. Words cannot express how much I love this! You are one amazing woman and I have learned so much from you. Thank you for sharing you home and your life with us. You are a joy! Fabulous! I like this idea in the entry much better than all the walls in the music room. Such a ligh-hearted look to greet people as they enter your home. But boy, what a lot of work! Crazy, crazy good! Sometimes when you come full circle, you end up where you were supposed to be in the first place! Gorgeous! Makes me want to get started on something similar! Love, love, love! Excellent! I like this much better than wall paper! You’ve done a bang up job! This will be a stunning backdrop for your Buffet! On another note: thanks for all your help with the info on tools, as I have just finished another project with compressor and nail guns and really am getting the hang of it. I love it! It’s absolutely beautiful! When would you like to come up and stay at my house?? I’m just an hour away from the Rocky Mountains! OMG – Stunning, it is just so WOW!!! Almost can’t stop looking at it. Thank you for sharing Kristi. Absolutely fab!!! This is a definite highlight in your house!!! Luv !!! Just amazing. Did you ever have to paint over a mistake with the permanent marker, and how did that go if you did? Does it cover well? You are soooo good at putting unexpected things together. Thank you for sharing your journey! I learn so much from you. Thank you. Beautiful job! It is inspiring! 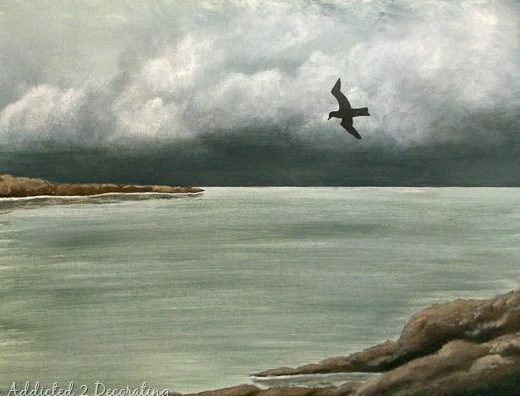 As for the edges….I can’t see them very clearly, but am wondering if you could just do a wash along the edge with the background color to make it look like the two colours are merging and mingling . Might give it a soft look and blend the change in color. And look intentional. Just a thought! Absolutely gorgeous!!! 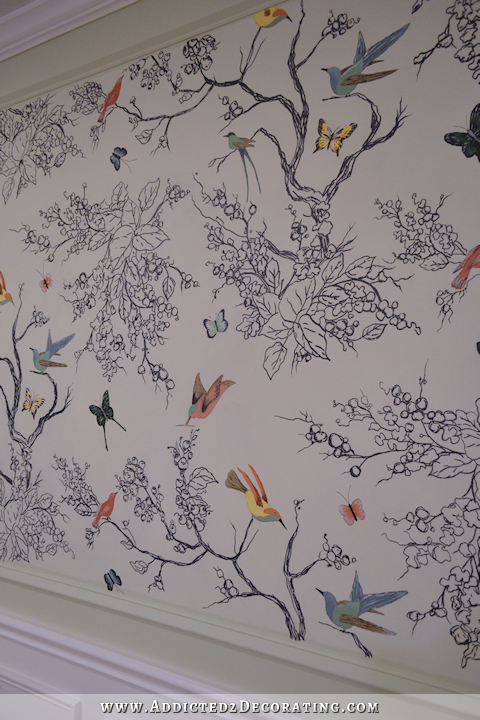 It looks exactly like the wallpaper in a boutique hotel I stayed in in Portland! Can I ask where you found the pattern? STUNNING!!!! It looks amazing with the wall color too 🙂 Nicely done! This looks absolutely stunning Kristi…..well done!!!! 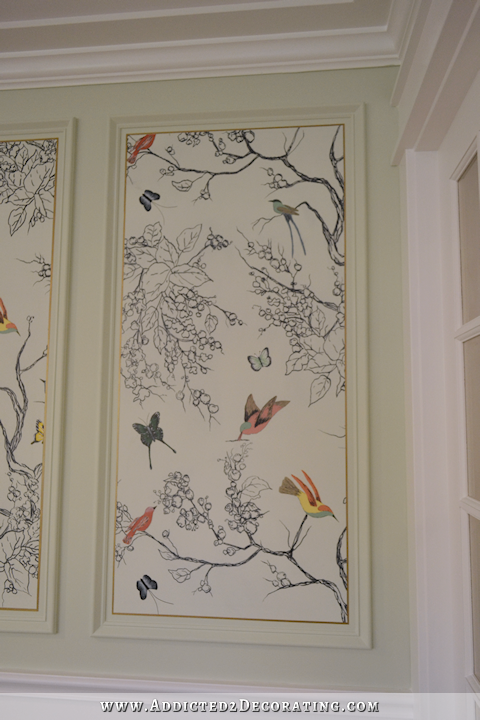 Your entry way wall is the perfect place for your custom wallpaper. So pleased that it makes you smile, it makes us smile too! I think the entry way and dining room are one of my most anxiously awaited reveals of yours ever. Have an awesome and creative weekend. That turned out amazing, not that there was any doubt, i think it will be prefect with your buffet and will tie in the other colors and elements you are bringing into the room. Way to go! In a word…Fantastic! This is such a unique and whimsical addition to the room. Love the pops of color. I wish I had your patience! 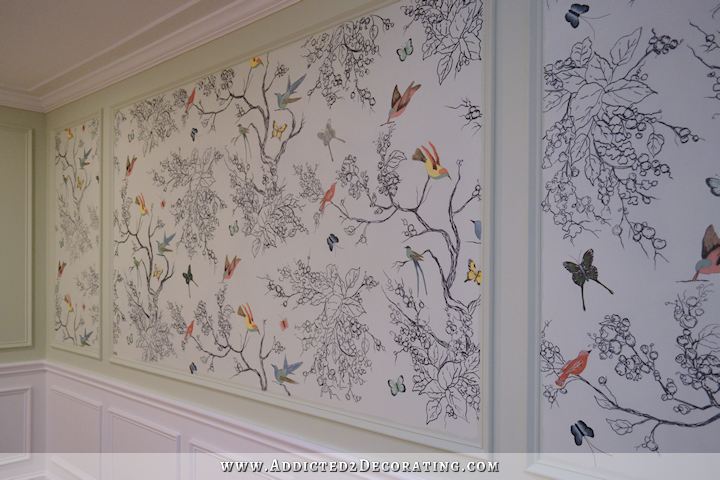 Oh my gosh…that entry wall is stunning! What an amazing job you did. You are so talented when it comes to creating a warm, welcoming space. Amazing!!! Looks beautiful!!! But I have to say . . . being a long time follower I was expecting to see at the end “April Fool’s, it’s really wallpaper”!! LOL I know from the past you have tried to fool us on this day. I remember the first one I read that said you were quitting the blog and how disappointed I was. Only to read further it was an April Fool’s joke!! Thank heavens!! You inspire so many and really do need to be on TV. You already have a large audience! Keep it coming. We love it!!! Enjoy your hard work. You should be very, very proud of all you accomplish in one day by yourself. Not many can say that! Have a restful weekend!! Absolute Perfection! Happy for you. It is simply beautiful Kristi! I think the addition of the butterflies was key. In nature, some objects appear naturally in odd numbers; petals on a flower branches in a tree, etc. 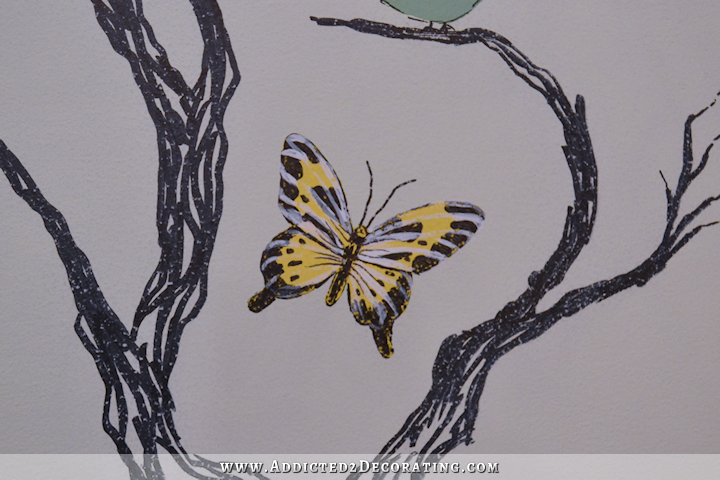 I think that’s why the trio of branches, birds and butterflies is so eye pleasing!! Can’t wait to see the whole picture!! It looks WONDERFUL!! I absolutely LOVE it!! You should sign your name to each panel as these are beautiful works of art! Really stunning. I am in awe of your talents! 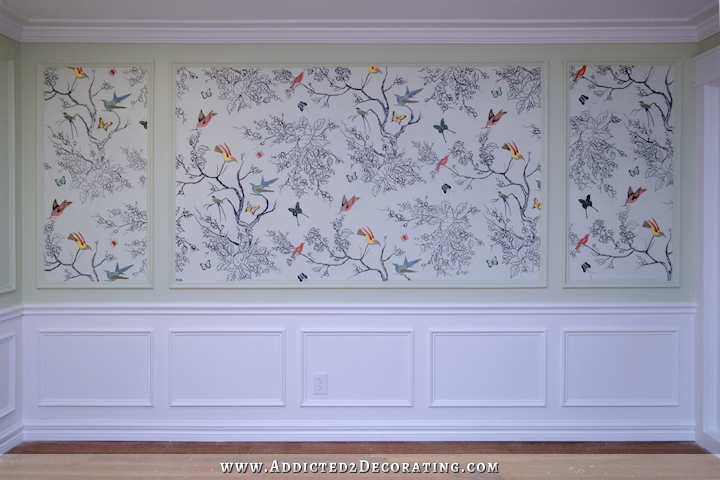 These lovely murals will give the room the foundation you need to make the fabric selections properly. I am only disappointed that we didn’t see the coral buffet in it’s spot beneath the murals. You nailed it on that wall!!! Nothing but “LOVE” to anyone who steps in that room and looks at that wall. 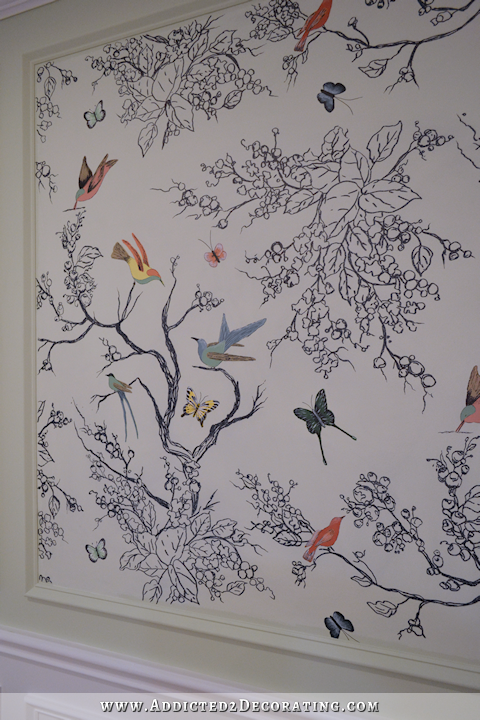 The birds and butterflies, all of it, is total “EYE CANDY”. 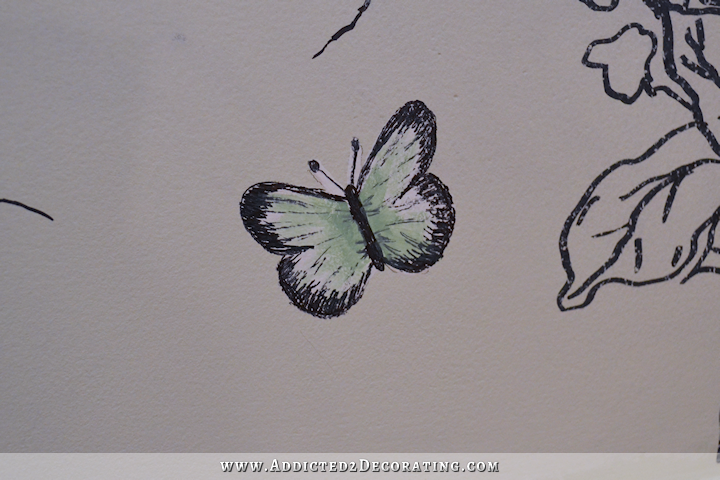 It goes so well with the new wall color, and has such a light airy spring feel. Good job! I am glad you rebooted and refreshed your mind back to the original direction you were heading. Just do the border in the same green as the wall and save yourself all the hassle. It will still look very good. Stunning! Can’t wait to see the buffet under it. You are amazing! Take a moment to bask in the glory and take a bow. You deserve it. A-MAZING!!! I bet it’s gonna look even greater with the buffet and I can already get the mood of your finished dining room without even trying, and without you saying much. Given that in the past I was actually reading all the details, and trying, and yet failing to see it, that’s gotta be a good sign!!! Can’t wait to see it finished! This is stunning. I love it. Are you ready for copy-cat murals all across the nation? Because you’ve started some thing with this! Love it! So happy you’re going back to some of your original ideas for the public spaces and can’t wait to see the finished entry and dining areas. OMG…this is stunning. 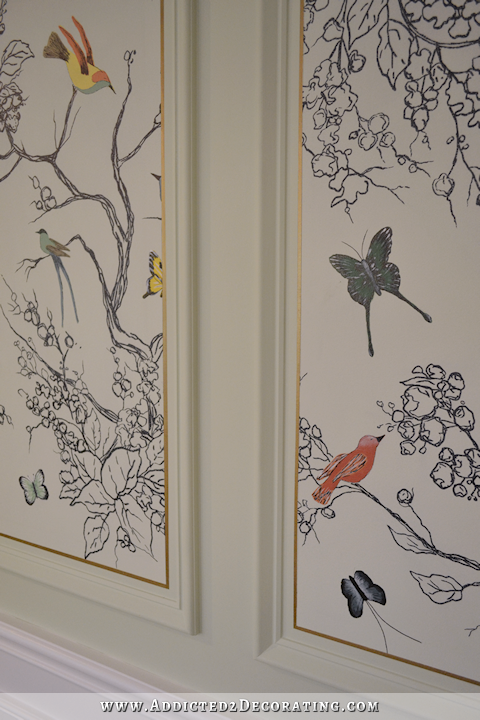 I love the detail you have put into each bird and butterfly. You have totally inspired me to try this in my house too. Love it!!!! Your house is going to be a mood brightener for anyone who walks in and a great place to come home to. It looks great!!! I want to do something similar in my home. I wandered around the house trying to figure out where it would work best! I do think it would be enhanced by adding a thin black border around each mural so it would really pop! Great job!!! Makes me smile too 🙂 I love it! Wow! Wow! Wow! Love it! Tell me you’re going to paint the top of the buffet and not leave it with the wood top under that mural. That’s gonna look way too casual under that masterpiece. WOW, WOW, WOW!!!! This is beautimous 🙂 I agree with mom, brother, sister, and Matt! It doesn’t need another border! 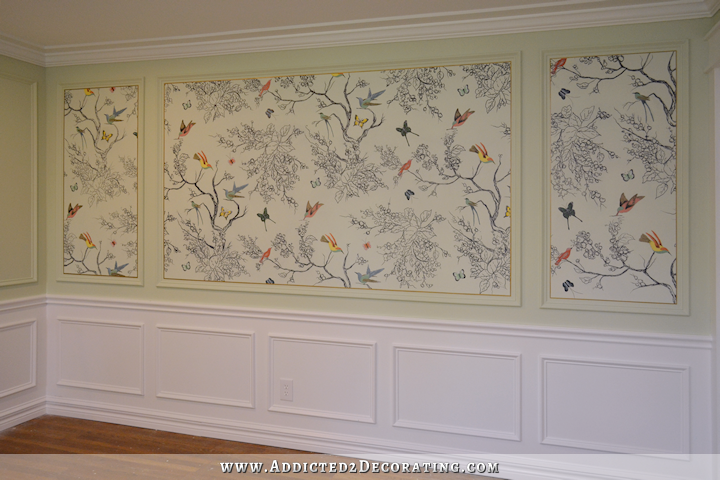 The trim pieces surrounding it, makes the border!!! This is fabulous, Kristi!! It is gorgeous! Simply amazed! It is such a lovely site to walk into! Wow !!!! What can I add that hasn’t already been said? Beautiful original art! IMO the wood top on the buffet will look great – a nice contrast to all the painted surfaces. Beautiful! I love this. You found the perfect spot to do this. And I agree it looks perfect without a border. Just beautiful. As we all knew it would be. How wonderful to see that each time you come into the room. Amazing job! 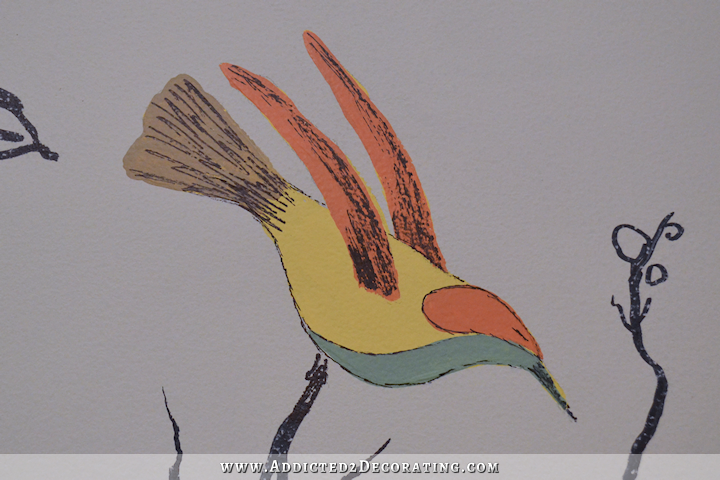 My father was a wallcovering designer so I do know how labor intensive this project was! 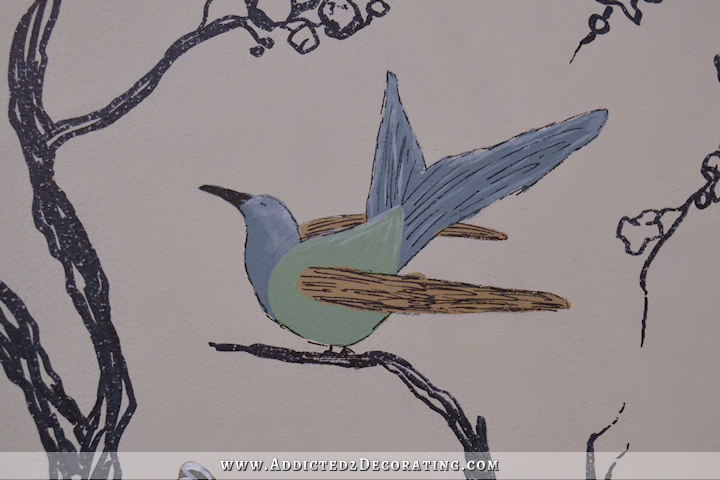 Why not add a small piece of trim painted wall color next to birds. If space between both moldings is also painted wall color it will just look like a slightly larger frame. This i one of the most exciting pieces of home decor I’ve ever seen. And the instructions about how to do it are doable! I’m so happy! Very effective. Way to go!! You have really come a l-o-n-g way. Wow! Oh my gosh, what they said. Wow! Love this – so refreshing and unique! You are very talented – not only to draw this, but to come up with the idea!!!! This is AMAZING! So glad you did this and stuck to what you really want. Can’t wait to see how you pull everything together. You found its place!!!! Looks great! Perhaps use a clear satin finish (one that will not yellow). It can add bit of interest without adding molding. Have you thought about a tiny gold edge molding next to the current molding? This is my favorite post of anything you have ever shared. This is absolutely the loveliest wall ever. And the artistry would not be as beautiful without the molding you worked so hard on. I enjoy every post you have but this is all time favorite. My hat is off to you!!! Simply breathtaking. I can’t wait to see the rest if your plan carried out. Have you finished choosing your fabrics yet? You and your mom should sign it :)!!! Ditto all the wonderful thing said :)!! Kristi, this looks FABULOUS! I love it so much! I also wanted to thank you for sharing the large design file with us too. I’ve wanted to do this in my (very tiny) powder room ever since I saw Shannon Berry’s design, but the room is too small for an overhead projector (it’s 4×5). I ADORE, I LOVE, I WANT a beauty just like this! You and your mom …special women! Hey any houses near by for sale? I would love to be able to run see Kristi and get my daily dose of inspiration! Love it! A unique and beautiful entry! Really, REALLY great job, Kristi! Your house is a show place! I would move to Texas, from Northern NY, to be able to live in your home. I can not decide what I love most, the doors in the music room (that are A-Mazing), the green cupboards in the kitchen or this wall? Or the ceiling in the bathroom. You are an amazing decorator. You outdo yourself every time! Dying to see the Coral buffet with it! WOW! Absolutely stunning! You continue to surprise & amaze me with your vison & talent. And your Mom is awesome! Love the concept but I think it needs something more to pop! Looks a bit dull, for a better word. The birds and butterflies are beautiful the rest a bit boring. Maybe a border? Kristi, so beautiful! You have so much talent and wow what a statement. So in love with that wall. Beautiful, you never fail to amaze me with you talent. Your coral buffet is going to look even more stunning on this wall now. Love it!! I’m looking at that green for my kitchen. overwhelmingly beautiful! took my breath away! pure joy! Love this beautiful trust your instincts over others I bet your border idea would look great and save you a lot of hassle go for it!!! Your Mom is so talented! It’s easy to see where your artistry and skill come from! You did a brilliant job of bringing her drawing – and your idea – to life. What a great team you make! 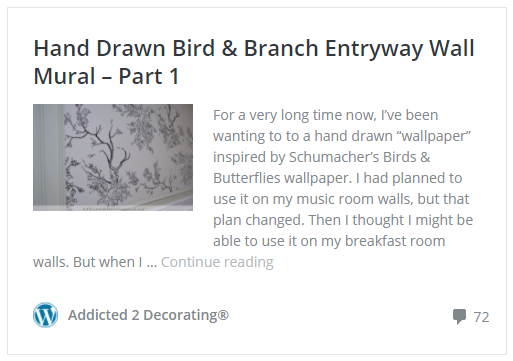 I used to follow dozens (if not hundreds) of design/DIY blogs. Over the years, I’ve whittled it down to you and only a handful of others. You never cease to amaze and inspire me. THAT! I love it! Perfection! I feel like a stalker – I want to invite myself over to sit at your dining table trimmed with gold and look at your entry way all day. Only thing though, is there is so much more to see in your home from that spot. The green kitchen, the music room, and on and on. . .Great job! I am not a jealous person. Just don’t have it in me,however, THIS IS THE PROJECT YOU HAVE DONE, (AND I CANNOT IMAGINE YOU DOING ANYTHING ELSE) THAT MAKES ME SWOON. When and if we move to the South (it won’t be TX) I will fly you to our city, rent you a truck, pay you of course, and pick out some area where we could do a mural. If you have friends in FL they can come and hang out, do what ever you want when not working, Matt can also come if he wants to, and if that is not enough, you can go through my jewelry and pickout what you want and take it. My daughter will kill me but so what,I a, getting old anyway. Can”t wait for you to clean the floors. Then three rooms are done. Five counting the kitchen and bath. It is really perfect for the foyer. All you need is the buffett, a rug/runner and a really cool hanging light. Not hanging too low, jus enough to light and define the space. You also said you were using two chairs on either side of the buffett. it will look great. The perfect Segway to the music room or dining room. I do not know what all the fuss is about the kitchen, it is behind two walls with a door at one end and a door in the middle of the wall you would really have to strain your necks to get a look at it. What a beautiful, welcoming entry to your home! It is spectacular! Maybe some gold highlights to tie in he table? This mural is absolutely breathtaking! You are so talented! Thank you for sharing. LOVE it – it works perfectly and it looks amazing. You never fail to disappoint, which is why I look forward to reading your blog. Thanks for sharing your talent with us! Gahhhhhh!!! I love this! It’s really one of the nicest things you’ve ever done! Your process would kill, me, but this is beautiful. 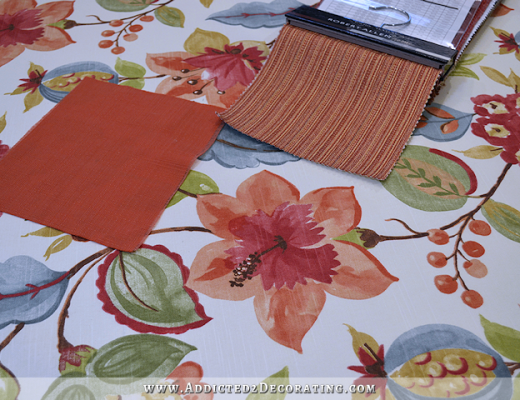 The organic lines of the pattern will be beautiful with the coral dresser. This is beautiful! When I saw that you had painted your walls white I was a bit stunned. White walls are not anything I expected from you. This is “YOU”. Fantastic!! Brilliant choices! Most excellent designs! Carry on, can’t wait to see what you have in mind for your next project! Beautiful!! Your house looks like one of those masterpieces of architecture which unfortunately are too expensive to replicate anymore (for mass consumption). Are there any tricks to getting that thin gold border so straight and even? hurrah to the finished border – it gives the mural the look of being put into an exquisite frame and thus is the perfect solution for an already perfect project 🙂 I love it! I just realized that you updated this post. L O V E all things about the way you finished the mural. Love how it will tie in with your ceiling light…love how the gold adds a statement finish to the mural that jacks it up…love how the inch-ish “stripe” of wall color gives additional dimension to your picture frame molding. I bet you’re so happy! A masterpiece! Congrats to you and your mother! I think the gold border sets off the mural beautifully! Love the gold! Finished it off perfectly! As I said the other day, I am green with jealousy, and every time I see this it makes me swoon. It is so beautiful. I would love it in my dining room. I noticed the gold immediately and thought here she goes with her gold, but in this case it is the perfect frame for this beautifully drawn artwork. It litterly takes my breath away. Love how you finished it off, it’s perfection! It’s amazing!! I couldn’t love it more! 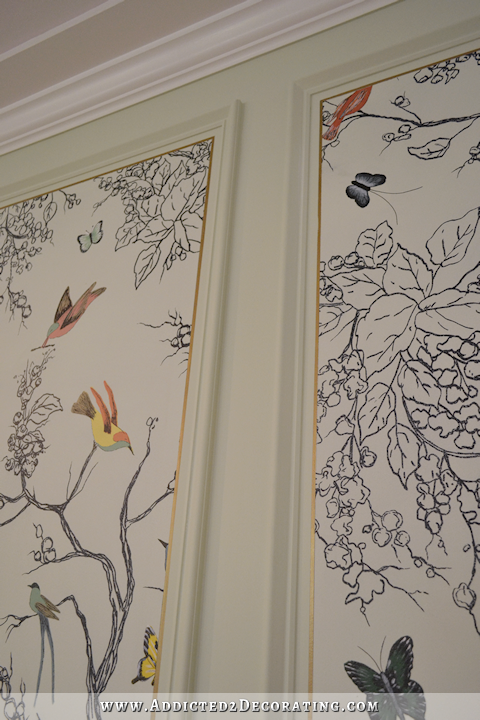 can you post a picture of the wallpaper so we can see the difference in what your mom drew and the actual print? I would love to see both of the now that yours is finished. Oh my word, this is breathtaking! I’m green with envy over here…(it may or may not have something to do with the fact that my handwriting is worse than a twelve-year-old guy’s! :P) You are so talented! Absolutely stunning!!!! Looks like a wallpaper mural. GREAT job!! This is stunning, breathtaking. I came to your site to learn how to tuft for a banquette backing in my kitchen which is now painted a cream yellow, or as I call it, artist canvas color. It looks like it needs art and I have been looking with not luck to find something to go above the tufted back board. I wouldn’t do this because my curtain actually look like your wall but in a soft mint background. Had I seen this first i would have wanted it and then got plain curtains. I used to draw and you have inspired me to go back to using my talents. I have pinned your site to my laptop! So much work… and it turned out perfect in every way! You are amazing!